The Palestinian Authority paints a picture - both verbally and visually - of a world in which Israel does not exist. 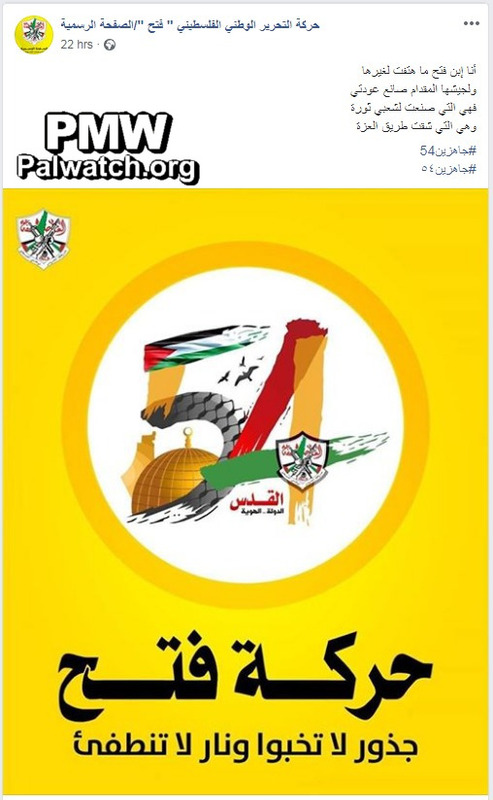 Children’s educational TV teaches that Palestine currently is a "state" (Arabic "dawla" = state) covering 27,000 sq. km - i.e., an area that includes all of Israel (the entire West Bank and Gaza Strip total only 6220 sq. km). Moreover, all Israel’s cities and infrastructure are referred to as "Palestinian": “Palestinian ports ... [are] Haifa, Jaffa, Ashkelon, Eilat, Ashdod, and Gaza". [PA TV (Fatah), Sept. 1 2008]. Maps provide visual reinforcement for this perception: Israel does not exist on any map; its area is marked as "Palestine." Maps showing the entire area of Israel covered with the Palestinian flag are routinely displayed at official PA events. The picture shows PA Minister of Education and Fatah Central Committee Deputy Secretary Sabri Saidam with a young girl, Sidra Al-Shawamreh, holding a plaque of honor on which is the PA map of “Palestine” that presents all of Israel as “Palestine” together with the PA areas. The image shows the text “The Gate of Mercy is ours” with a hand holding a large key extending from one of the letters on top. 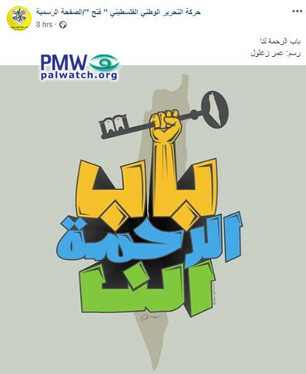 Behind the words is the PA map of “Palestine” that presents all of Israel as “Palestine” together with the PA areas. 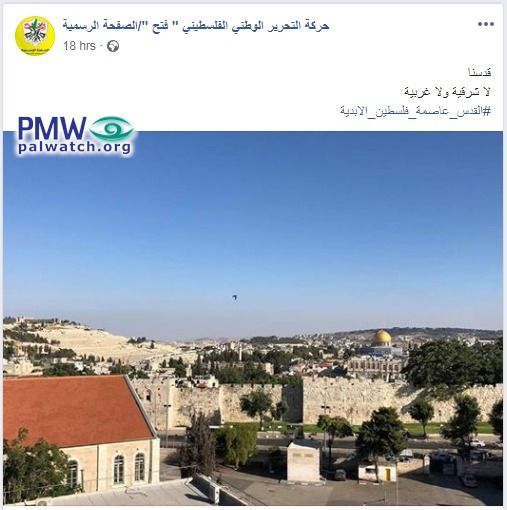 The image refers to a compound near the Gate of Mercy of the Temple Mount being closed after the Jordanian Waqf violated a court order by reopening it; see note below. The image shows the PA map of “Palestine” that presents all of Israel as “Palestine” together with the PA areas, covered in the colors of the Palestinian flag. The picture shows Jerusalem with the Dome of the Rock in the background. 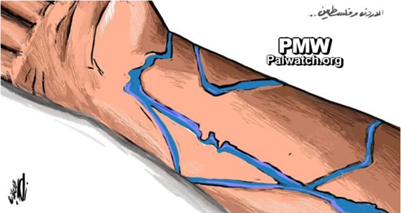 The cartoon shows an inner forearm and wrist with blue lines on it in the shape of Jordan and alongside it the PA map of “Palestine” that presents all of Israel as “Palestine” together with the PA areas. 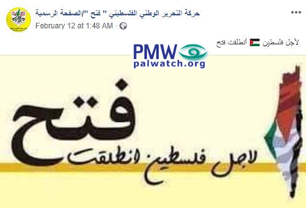 Visual: Various decorative items are shown bearing the PA map of “Palestine” that presents Israel as “Palestine” together with the PA areas, in the colors of the Palestinian flag and with the word “Palestine” in English. 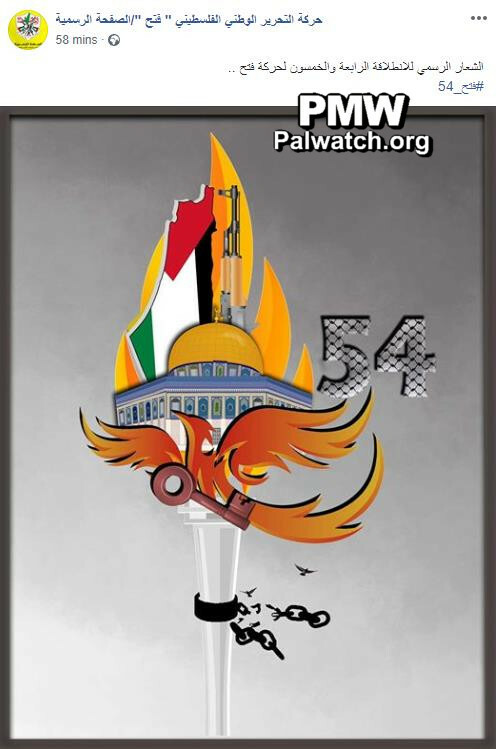 The screenshot shows a logo for the 54th anniversary of Fatah’s “Launch” (Intilaqa), commemorated on the anniversary of their first attempted terror attack against Israel, with the Dome of the Rock behind it. 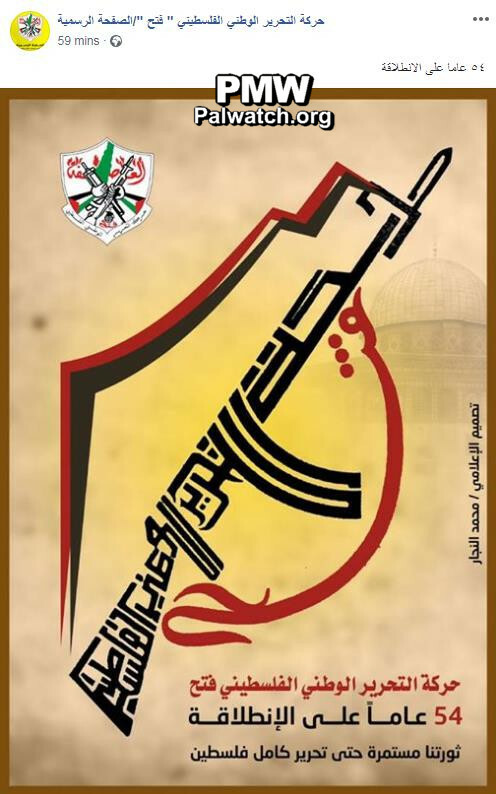 The logo is comprised of the word “Fatah,” with the Dome of the Rock forming part of the first letter. 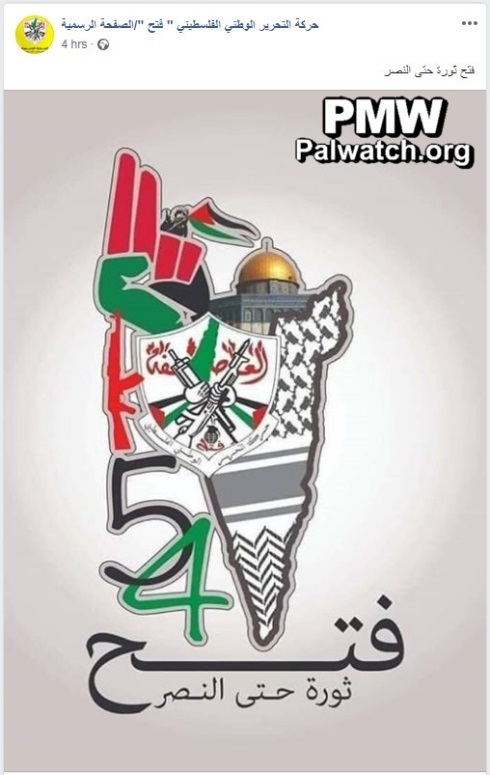 The second letter is in the form of the PA map of Palestine that presents all of Israel as “Palestine” together with the PA areas, and has the number “54” in the center of it. 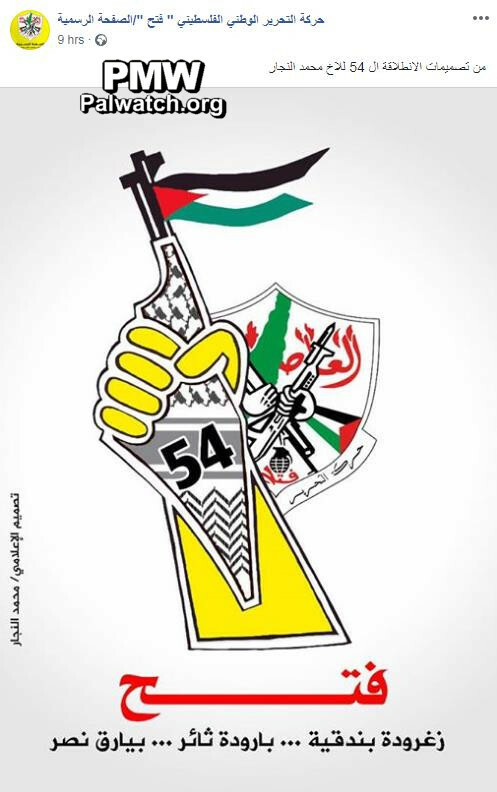 The image shows a logo for the 54th anniversary of Fatah's "Launch" (Intilaqa), commemorated on the anniversary of Fatah's first attempted terror attack against Israel. 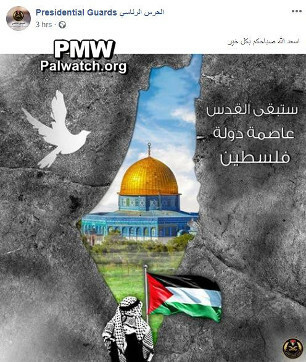 The image shows the PA map of “Palestine” that presents all of Israel as “Palestine” together with the PA areas, and in it is seen the Dome of the Rock. To the left of the map appears a dove, and standing in front of the map is a Palestinian wearing a keffiyeh (Arab headdress) and carrying a Palestinian flag. 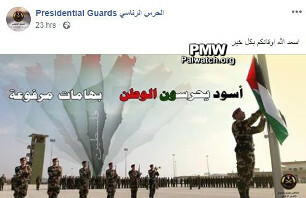 The image shows PA Security Forces members standing in formation for the raising of the Palestinian flag. 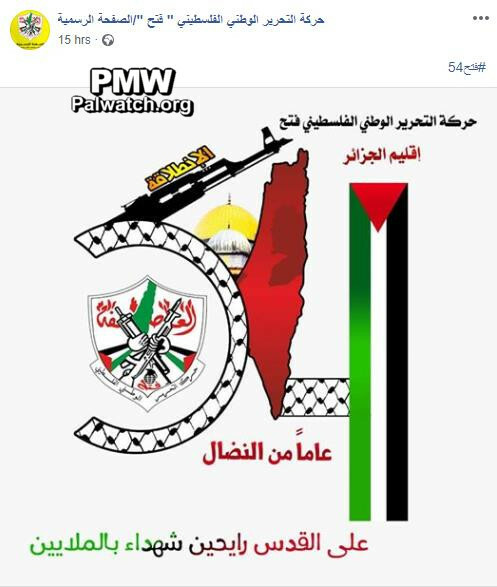 On the left side of the image is the PA map of “Palestine” that presents all of Israel as “Palestine” together with the PA areas, in the colors of the Palestinian flag and with “Palestine” written on it. “Yesterday morning, Friday [Nov. 30, 2018], and over the last two days, the protests have continued in the Arab cities against the violence and murder crimes [against women], while the protesters shouted in a demand to uproot the severe phenomenon that is on the rise in a troubling manner recently." 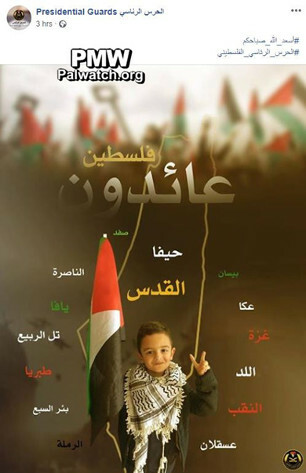 The image shows a young boy wearing a keffiyeh (Arab headdress) and making the “V” symbol for “victory” with one hand while holding a Palestinian flag in the other. Behind him is the PA map of “Palestine” that presents all of Israel as “Palestine” together with the PA areas. 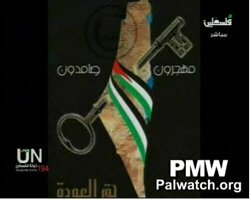 In the background is a picture of protesters holding Palestinian flags and keys that symbolize “the return” of Palestinian “refugees”.